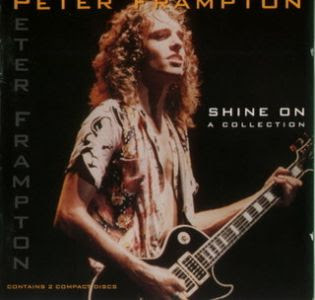 Wheeler's Dog: Peter Frampton 'Shine On: A Collection"
Peter Frampton 'Shine On: A Collection"
Yes. I am aware that I haven’t updated for almost a week. When I haven’t been busy (working with 2GNC and our sister station), I’ve been hiding out like Bin Laden. I haven’t been answering my phone like I should and I’ve lost touch with friends. I’m a weird one when I get busy… I will hole up somewhere and stay out of sight. And I’ll relax and decompress in front of the television. Not the most constructive thing, but it drowns out the voices in my head that yell at me to kill, kill, kill. My sleep schedule has been drastically altered over the last two weeks. I haven’t been getting enough sleep and when I’ve had the opportunity to sleep… I’ve been keeping old man hours… Early to bed and early to rise. I’ve got so many early worms that I could feed a fish farm for a week. --Over the last week, I purchased some plastic storage tubs to put my winter clothes in. Sweaters, long sleeve t-shirts, sweats, and the like. I couldn’t believe what I saw! 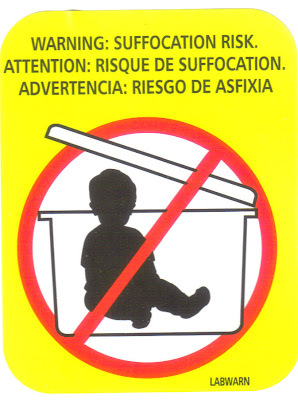 It seems that there are people out there in our world that still don’t understand how to properly store children. Sure, plastic tubs seem like a cheap alternative… But spending the extra money on dog cages will let the kids breathe and keep Brother Bacon off your back. --The immediate family went to Tina (my sister) and Richard’s (brother-in-law) house for a little outside dining experience. Somehow, the subject of television shows came up and Tina was practically knocked over to hear that I enjoy Gilmore Girls. I’m really starting to love this show! I’m in the second season (thank you, Netflix) and I’m definitely enjoying it. Gilmore Girls has that same type of quirkiness that I liked about Northern Exposure. It’s filled with small town non-conformists and pop culture references. There’s even been a reference to the horrible 1970’s Saturday morning television show Dyna Woman and Electra Girl. Should I become concerned about my estrogen levels? Will Gilmore Girls make my breasts grow? So what! It’s a damn fine show. If my breasts grow then I’ll just have something else to play with. --I got my stimulus check last week and I purchased a few accessories for my Zune MP3 player. I got an AC adapter that uses the USB cable and a car adapter/charger. The AC adapter is basically a piece of plastic with two prongs that you plug into an outlet. The damn thing costs $30 bucks retail! Once I cut it loose from its plastic Fort Knox like package, I was amazed by its simplicity and lack of weight. I’m sure that plastic little joker costs about a $1 to produce and was put together by a couple of Chinese kids that were paid 25 cents an hour. An outrage! The car adapter has taken a ride yet… I’m looking for the right road trip. --My boss Doug McKnight sent out a YouTube link for this creative and incredible waste of time… Someone spent a lot of time editing KISS concert footage to match up to a Rick Astley hit. Enjoy. You're a bit off. The show was, 'Electra Woman and Dyna Girl.' And for someone known for their love of campy, cheesy, so-bad-it's-good movies and TV, you're the last person I would expect to call this cult classic "horrible." I know this, but for some reason... It just didn't translate from my brain to my typing fingers. And I didn't catch it in the proofread. Oh, don't get me wrong... The show is laughably horrible.